CNet UK is reporting that Microsoft has stated that over 155,000 units of the Xbox 360 HD DVD add-on drive have been sold in the United States. 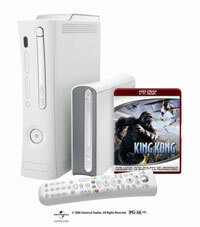 The Xbox 360 HD DVD add-on is an external, read-only drive that can be used to playback HD DVD movies through the Xbox 360 console or a computer. Connecting the drive to a computer is not officially endorsed or supported by Microsoft, but it works just fine. With the Xbox 360 HD DVD drives selling from $199 (and as little as $149 during some sales), it is not much of a surprise that they have outsold the higher priced HD DVD standalone players. Toshiba recently announced that they have sold 150,000 HD DVD standalone players in the US. This would bring the total amount of HD DVD players in the US to approximately 305,000. The amount of Blu-ray standalone players sold in the US has been estimated at 100,000. The PS3, which has a Blu-ray drive embedded directly within the console, has sold approximately 1 million units in the US. The HD DVD group has claimed that only 30% of PS3’s are connected to an HDTV, which would bring the effective PS3 Blu-ray player numbers to approximately 300,000. If this 30% claim is valid, it means that there are approximately 400,000 effective Blu-ray players in the US compared to the 305,000 effective HD DVD players. This ratio could easily further increase in Blu-ray’s favor as current PS3 owners with standard TV’s upgrade to HDTV’s. Even if the estimations above are incorrect, the number of “players” sold on either blue laser format can still be considered quite low. This format war still has a long way to go and there may not ever be a clear winner if both formats sell enough players. The 2007 holiday season will be a crucial time for both HD DVD and Blu-ray as the battle continues to unfold. CNet UK news found via CDRLabs. Well this is only my opinion! * Have more support from the movie-studios than HD-DVD have. movie-studios who support HD-DVD to choose Blu-Ray instead. * The movie-studios will do anything to protect their movies from pirates and their for choose a format that has an extra barrier in their hip-pocket. The add-on was used as a PC drive directly plugging into a USB port on a PC.